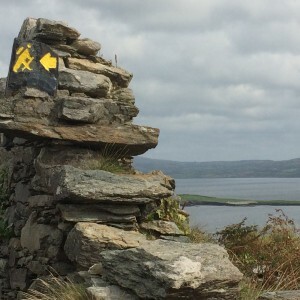 From the car park at Dún Óir on the north side of the peninsula, go over the timber stile way marker, Christian Cross no. 1. Follow the Mass Path way markers uphill until you reach The Mass Path Junction sign/ way marker no. 151. Take the Sheep’s Head Way West Barán/Seefin option. Continue on until you reach The Windy Gap Junction sign/way marker no. 165 and take the Sheep’s Head Way West via the Goat’s Path option. Continue on down until you reach way marker no. 178. At this point you will be walking down in a generally northerly direction until you meet the public road at way marker no. 190. Take a right turn here, and continue along the public road in a northeasterly direction and back to the car park at Dún Óir. Arrows: Orange arrows and follow the Mass Path Way markers (Christian Cross Symbol) until way marker no. 151. Then follow the main Sheep's Head Way yellow man markers. From the car park at the Black Gate and Alice West Centre past the village of Kilcrohane, follow the purple loop walk arrows for the Cahergal Loop Walk in a northeasterly direction along the public road for a short distance. At way marker no. 3 (Peakeen, Cahergal and Caher), turn left off the public road. Continue up the track and onto the hill going through 4 stiles en-route until you reach way marker no. 15 (Peakeen and Cahir) and turn left. 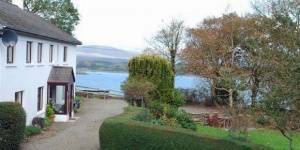 Continue on, crossing the peninsula to the Bantry Bay side, until you reach the car park at Cahergal. Keep left after going over the timber stile and cross the road where you will go over another timber stile, passing way marker no. 206. Continue straight on for the cove, passing the the ruins of a famine hamlet known locally as the “Crimea” and the abandoned copper mines, en route. At way marker no. 238, keep left and walk a short distance along the pubic road. Turn right at the finger post sign for “The Poet’s Way” and go off-road over a timber stile, at way marker no. 65 Poet’s Way/Cahergal. Follow the way markers to traverse the peninsula to the south side until you meet way marker no. 348. Turn left here and continue straight on until way marker no. 354 and turn right. Continue on down to the public road and back to the Black Gate / Alice West Centre. 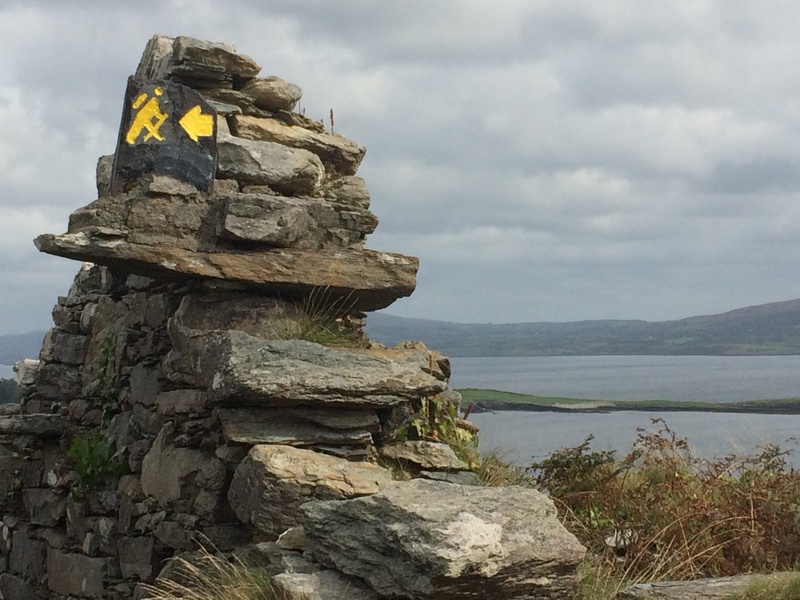 The Caher Loop Walk leads you up to the ridge of the Sheep’s Head peninsula, with fine views over Bantry Bay and Dunmanus Bay! From the car park at the Black Gate / Alice West Centre just outside Kilcrohane village, follow the green loop walk arrows in a northeasterly direction along the public road for a short distance. At way marker no. 3 (Peakeen, Cahergal and Cahir) turn left off the public road. Continue up the track and onto the hill going through 4 stiles en route until you reach way marker no. 17 marked Peakeen/Cahir. Turn right down the hill beyond Cahir lake on an old road. When this road meets the public road turn left. Walk along the public road for a short distance then turning right downhill again onto “the stony roadeen” passing by a private garden. Next veer right onto the public road again for a considerable distance. At way marker no. 368, veer right again walking in a southwesterly direction on the public road passing “The Cill” at Caher, a famine graveyard en route. The loop enters farmland at way marker no. 366 and descends towards the sea. At Trá Rúaim strand, veer right uphill on the public by-road and right again when this road meets the main public road to return to The Black Gate. From The Old Creamery in Kilcrohane, walk in a northeasterly direction back up the peninsula following the red arrows and main Sheep’s Head Way ‘yellow man’ markers. At marker no. 404, turn right off the main public road entering farmland. Continue on downhill to Farranamanagh strand and lake, walking beyond these and on uphill on rough ground beyond the Bardic School. The school was home to O Dalys – chief poets to the O Mahony clan – and it was here on the coast of the Sheep’s Head peninsula that they passed the Irish poetic tradition from generation to generation. Continue on to meet the main public road, turn left and you will arrive at Dromnea car park, way marker no. 425. Here you can return directly to Kilcrohane village via the public road or continue on the loop by climbing the old stone stile to the left of the gate across the road. Continue on uphill until you reach way marker no. 92 on the old Kilcrohane/Ahakista road. Continue straight on again until you reach way marker no. 01, veer left here for Kilcrohane, and continue on again in a southwesterly direction. At way marker no. 10 follow the road down until you meet the main road. Take a right turn here and the main road will lead you back to Kilcrohane village, where a bite to eat at The Old Creamery will be a welcome reward for your walk! The Farranamanagh Loop Walk is one of 20 loop walks along the Sheep’s Head Way Walking route on Ireland’s southwest coastline. It’s a gorgeous walk out along the ridge of the Sheep’s Head. At every time of year, you’ll find something to delight the eye as you look across bays, moorland and lush green valleys. The walk is a perfect introduction to Ireland’s Wild Atlantic Way walks! Look out for a passage tomb and a Mass Rock along your route. Why not call down to the village of Kilcrohane after your walk for dinner at The Old Creamery, or a visit to the Sheep’s Head Producer’s Shop? Begin your walk behind the Pietà statue, and follow a route that leads you along the ridge of the Sheep’s Head peninsula, with spectacular views out over Dunmmanus Bay, the Mizen peninsula, and the Fastnet Rock to the east. 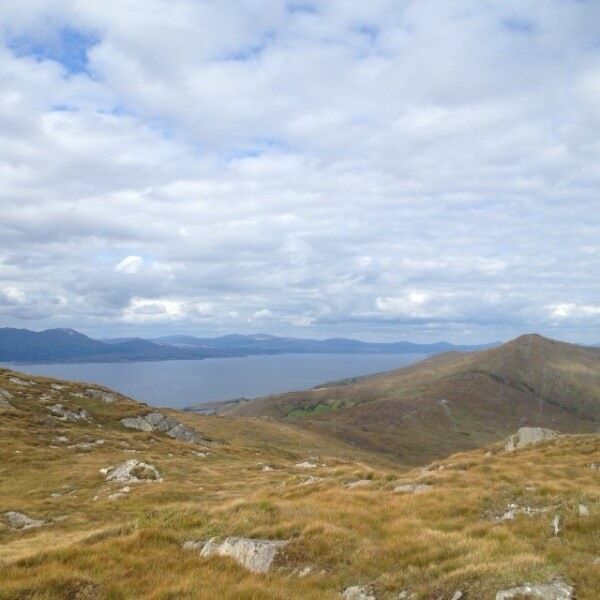 To the west, you’ll see Bantry Bay, Beara, Bere Island, and even the Bull Rock on a clear day. From the car park at the top of the Goat’s Path, follow the orange arrows and orange ‘walking man’ way markers heading in a southwesterly direction, passing behind the Pietà statue and marker no. 60 (Peakeen) as you go. Continue on along the ridge passing a megalithic tomb en route. Further on you will descend the hill and almost straight away you will ascend another hill. Continue on along the ridge again until you will start to descend again at way marker no. 15 (Peakeen, Caher) veer right following the way markers for Cahergal. As you go over the stile at the public road at Cahergal car park, keep right at way marker no. 205 and continue along the public road in a northeasterly direction. At the finger post sign for “Horse-shoe Road” and Finn McCool’s Seat near way marker 200. Turn right here, and this track will take you back to the public road to way marker no. 194. Turn right here and the road takes you back to the car park at the top of The Goat’s Path. Facilities: Car Parking spaces available and bike rack.